1. I am indeed happy to be amidst you to participate in the International Day of Older Persons. 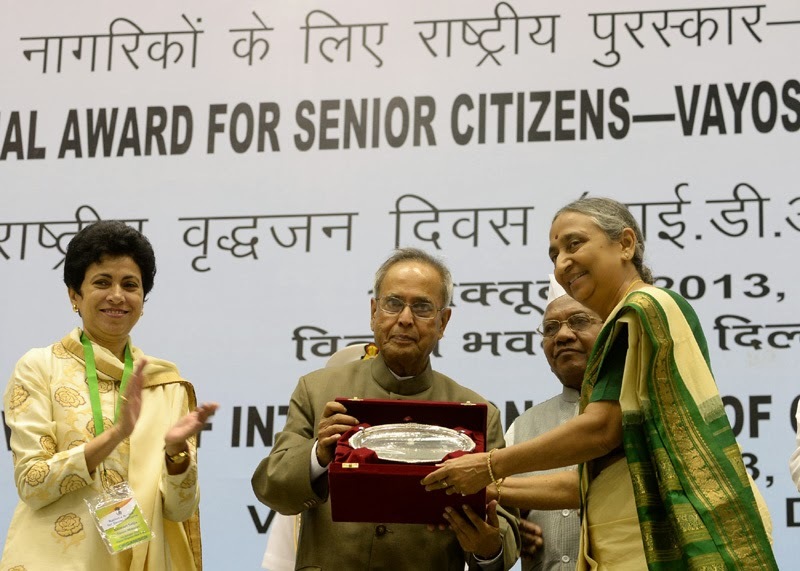 It is a day when we, in India, recognize and honour eminent senior citizens and institutions for their outstanding contribution for the welfare of older persons. 2. The conferment of the Vayoshreshtha Samman for the first time this year is, indeed, a welcome initiative. I congratulate the Ministry of Social Justice and Empowerment for this initiative and I congratulate and felicitate all the awardees. You are really karmayogis. With your selfless service and dedication to the elderly, you are being faithful to our tradition of respect and service to our elders. 3. Ladies and Gentlemen, India is a country which has the oldest civilization and from time immemorial our forefathers taught us, parents are to be respected. These are the social values enshrined in our civilization. If there is a deviation in this regard, we have to rectify it. We Indians have the collective responsibility to establish and sustain an environment of safety and security for all the vulnerable sections of our society, including our senior citizens. Article 41 of the Constitution of India provides, inter-alia that the State shall, within its economic capacity and development, make specific provisions for securing public assistance to the elderly persons. Various measures are being taken and many more are likely to follow with the advancement of time. 4. With the advancement of medical care and health services, rising life expectancy is now a global phenomenon, leading to an unprecedented rise in the numbers of senior citizens in all societies around the world. Our country is no exception. In the year 2001, the population of our elderly was over 7.66 crore. This is projected to increase further to 17.32 crore by 2026. 5. However, it is ironical that economic growth, modernization and the migration of our youth to urban areas for employment have created a situation where the elderly are being deprived of the respect, love and care that they need. The greatest tragedy of old age is the perception of being unwanted and unloved and having no purpose in life. Our traditional joint family system that provides tremendous emotional and physical comfort and support to our elderly people is fast giving way to the nuclear family structure. 6. Thus, the elderly in our country are increasingly facing a variety of problems associated with modernity and growth and also the attitudinal change in social values. I am aware that the Government of India seeks to formulate and implement sound policies for their financial and food security, their health care and other vital requirements to improve the quality of their lives. Central Ministries and Departments have been co-coordinating to implement specific schemes and provide concessions and facilities in the form of income tax rebates, rail and air concessions and higher interest rates for bank deposits etc. 7. The enactment of “The Maintenance and Welfare of Parents and Senior Citizens Act, 2007” was a very positive step in the right direction. I have been informed that the Model Rules brought out by the Ministry of Social Justice and Empowerment prescribe, in detail, the duties of the police for protecting the life and property of senior citizens. 8. Ladies and gentlemen, it is said that the true test of a developed and civilized society is the manner in which it values and protects the vulnerable sections of the society. I cannot emphasise enough how important it is for our society to prevent any erosion of the in-built safety mechanisms that our society has evolved for our elders. We, Indians, must make it our duty to be more sensitive to the older citizens among us. We must do all that we can to ensure that they live each day to the full, enjoying a healthy, dignified and productive life. They must be motivated to participate whole heartedly in the economic, social, cultural and political activities of the society in which they belong. 9. Government must mainstream the issues concerning the aged and ageing in India. Their needs and requirements should not be overlooked or responses of Government and society delayed for any reason. We must strengthen the self-confidence of our elderly. It is, after all, their generation that have built the modern vibrant India that we are enjoying today, full of optimism as we move forward into our future. Our elders should definitely have a sense that they are reaping the fruits of their hard work and contribution to our prosperity. 10. This day should also be an occasion to take new initiatives. Elders, themselves, can organize themselves to collectively identify the areas where they would like Government and society to intervene and bring improvements in their lives. 11. Senior Citizens are a vibrant resource as we move forward. There is no reason why they should not have employment opportunities and income security. Older women must, similarly, be protected from discrimination, neglect and inequalities. Today, medical advances have enabled practitioners and institutions to give better care to the elderly. I would call upon the medical fraternity to take more initiatives that further facilitate the elderly and make their visits to doctors and hospitals a pleasant experience, not a nightmare. 12. Before concluding I would like to share the words of a famous American General, Douglas MacArthur, who said, and I quote, “You are as young as your faith, as old as your doubt; as young as your self-confidence, as old as your fear; as young as your hope, as old as your despair”. These words, would, I hope, inspire all senior citizens in our country to be more positive in their thinking. 13. I wish you all good health and extend to you my best wishes for your well being and happiness. Don’t consider you are redundant. You are useful, you are valuable, you are experienced, your maturity can guide the younger generation. I call upon all Indian citizens to renew their commitment to the welfare of their elders, to value their guidance and to cherish their precious company. 14. Once again, I offer my warm felicitations to the senior participants in today’s programme particularly the recipients of the national awards today. I wish you all success to provide inspiring leadership to the younger generation.